This regulated 5V output provides a few milliamps. 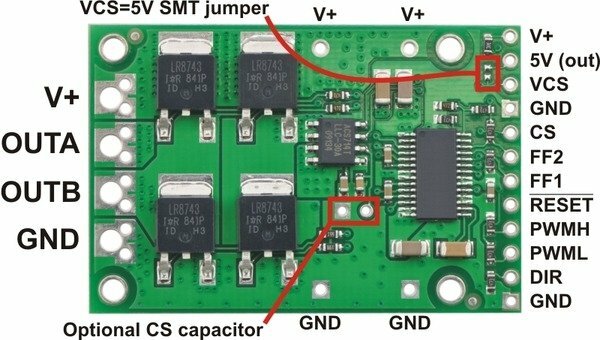 It can be shorted to VCS to power the current sensor. This output should not be connected to other external power supply lines. Be careful not to accidentally short this pin to the neighboring V+ pin while power is being supplied as doing so will instantly destroy the board! 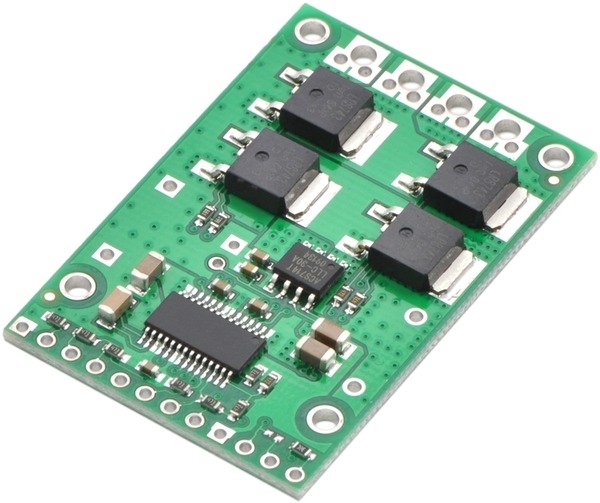 Connect 5 V to this pin to power the current sensor. 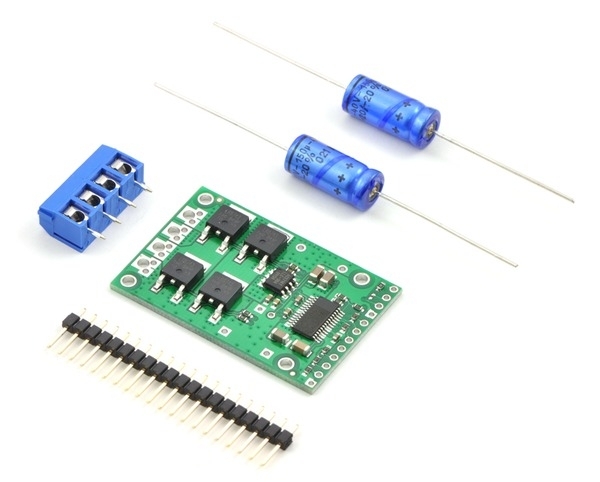 ACS714 current sensor output (66 mV/A centered at 2.5 V). HIGH Control input that enables coasting when both PWML and PWMH are low. See the “motor control options” section below for more information. LOW Direction input: when DIR is high current will flow from OUTA to OUTB, when it is low current will flow from OUTB to OUTA. 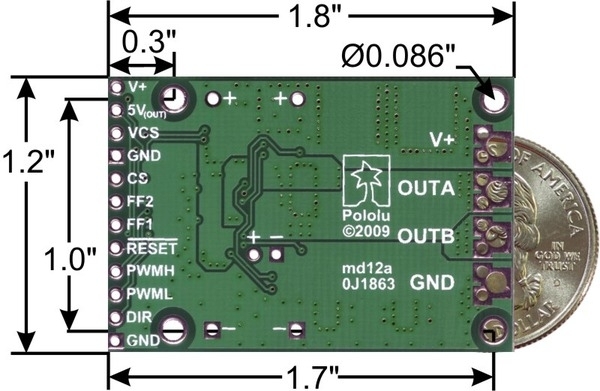 Pololu high-power motor driver CS with included hardware. 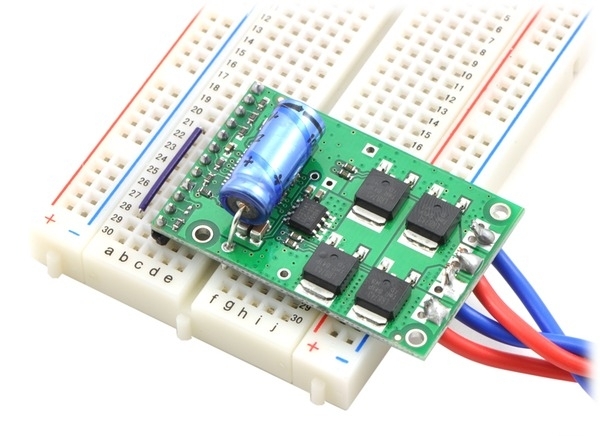 Pololu high-power motor driver CS in a breadboard. 1.Without any connectors or through-hole capacitors. 2.Typical results with 100% duty cycle at room temperature. 3.Bidirectional centered at 2.5 V with VCS of 5 V.
4.Higher frequencies are possible, but duty cycle will be limited by dead time of approximately 3 μs per cycle.